Violinist Nicola Benedetti and jazz trumpeter Wynton Marsalis are sharing a sofa backstage at the Glasgow Royal Concert Hall. Neither seems willing to take sole credit for hatching a plan that has resulted in a brand new violin concerto, written by the New Orleans-born jazz virtuoso for Benedetti, which she will premiere in London in November with the London Symphony Orchestra (LSO), the creation of which will also be the subject of a BBC documentary to be screened early in 2016. “He DID say it,” Benedetti insists. “I don’t remember being the one who said it,” counters Marsalis. Thankfully the interview goes uphill from here, and I begin to sense the mutual respect these two very different musicians have for each other, and the amount of collaboration that has gone into such a unique project. We spoke last weekend, prior to their appearances in Glasgow with the National Children’s Orchestra of Great Britain, and just as Benedetti had been named as that orchestra’s new vice-president. Typically, she was in the throes of a busy week, having hot-footed it to Glasgow from a London Proms appearance with the Bournemouth Symphony Orchestra, before heading east for last Sunday’s starring role with the Oslo Philharmonic at the Edinburgh International Festival. They had talks and seminars from the likes of Bill Clinton, Denzel Washington and Sally Field. But it was at the Jazz at Lincoln Center venue, where each of the music delegates had to perform in the company of the older Marsalis and his quintet, that the lasting friendship took root. But by musical nature they are worlds apart. The 53-year-old Marsalis, who founded Jazz at Lincoln Center, is most at home in the company of jazz musicians. He’s performed with the greatest names, from Dizzy Gillespie and Herbie Hancock to Eric Clapton, with whom he recently released a live blues album. For Benedetti, the world of Mendelssohn and Bruch are her natural comfort zone, and while she’s dipped her fingers in the world of folk, collaborating with Aly Bain and Phil Cunningham, jazz has remained something she’s enjoyed listening to rather than playing. So what can we expect from this new concerto, which, for Marsalis, is an ambitious follow-up to Swing Symphony, a previous orchestral commission for the LSO? The titles of the four movements give a clue to the mixture of influences – Pastoral Rhapsody, Dance Burlesque, Blues and Reel. And the cross-fertilisation of expertise has certainly made the creative process an exploratory one. He has a notebook, dating from seven years ago, in which Benedetti has written out scale fingerings and other useful tips. “Basic practical things that are hard to grasp if you don’t play the instrument,” she explains. With Marsalis, Benedetti has been involved from the very beginning. “We’ve had an enormous amount of contact, but there’s still a long way to go. 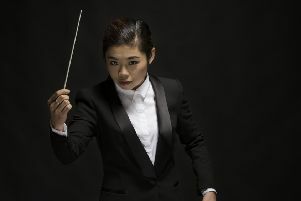 Most of the discussions till now have been on the work itself, about orchestral colour, the scale of the piece, the balancing of the solo instrument against the orchestra,” she explains. Already they’ve made 36 corrections to the first movement alone. They plan to “quietly workshop” the concerto in America prior to its London premiere. As yet, there are no plans for a Scottish performance, but Benedetti is insistent that will eventually happen.” There’s no way it won’t,’ she promises. However, fans will be delighted that she is touring Scotland next month with her partner, cellist Leonard Elschenbroich, and instrumental ensemble, in a programme of Vivaldi and Tchaikovsky, as well as showcasing a new work, Duetti d’Amore, for violin and cello by Mark-Anthony Turnage. “One of the movements is a blues movement,” Benedetti reveals.